Scientific Instrument Commission publications include ongoing thematic series, a cumulative bibliographic database, and occasional Papers and Proceedings from past symposia and workshops. In addition, the Commission has had a distinct and identifiable section within an annual issue of the journal Nuncius. Minutes of the general meetings of the annual SIC symposia are posted under the respective past conference. 2001 section presented papers read at the "Archives of Instrument Dealers and Collectors" session at the XIXth Scientific Instrument Symposium (Oxford, 2000). 2002 section offered the first group of papers from the The Making of the Spectroscope workshop held at the Deutsches Museum (Munich, 2001). 2003 section offered the second group of from the The Making of the Spectroscope workshop held at the Deutsches Museum (Munich, 2001). 2004 section contained a series of papers titled "SIC Instrument Case Studies 1850-1950" from the XXIth (Athens, 2002) and XXIIth (Newport News, 2003) Symposia of the SIC (edited with an introduction by Jim Bennett). 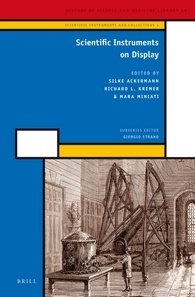 Volume: 46/4: Scientific Instruments on Display, edited by Silke Ackermann, Richard L. Kremer, and Mara Miniati (2014, 280 pages, ISBN 9789004264397). This book offers selected studies of instruments on display in museums, national fairs, universal exhibitions, patent offices, book frontispieces, theatrical stages, movie sets, and on-line collections. Please visit the Brill Publishers web site to order this volume. 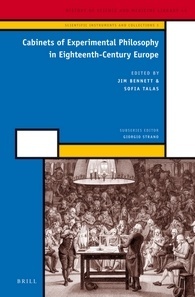 Volume: 40/3: Cabinets of Experimental Philosophy in Eighteenth-Century Europe, edited by Jim Bennett and Sofia Talas (2013, 296 pages, ISBN 9789004252967). Cabinets of Experimental Philosophy in Eighteenth-Century Europe explains how collections of instruments for demonstrating the principles of Newtonian science were offered successfully to a broad public audience and formed . Please visit the Brill Publishers web site to order this volume. 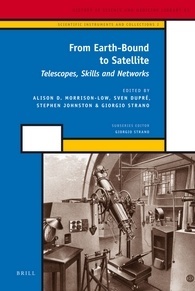 Volume: 23/2: From Earth-Bound to Satellite: Telescopes, Skills and Networks, edited by Alison D. Morrison-Low, Sven Dupré, Stephen Johnston, and Giorgio Strano (2011, 268 pages, ISBN 9789004211506), presents a series of essays related to the history of telescope from the 17th to the 20th centuries. Please visit the Brill Publishers web site to order this volume. 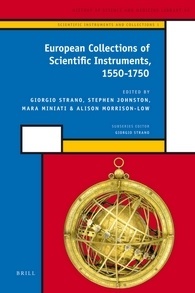 Volume: 10/1: European Collections of Scientific Instruments, 1550-1750, edited by Giorgio Strano, Stephen Johnston, Mara Miniati and Alison Morrison-Low (2009, 220 pages, ISBN 9789004172708), offers a rich selection of papers presented at the 2004 SIC Symposium of Dresden. Please visit the Brill Publishers web site to order this volume. 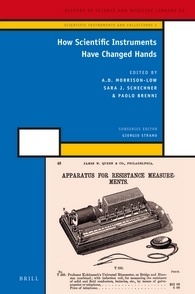 Volume: 56/5: How Scientific Instruments Have Changed Hands, edited by .D. Morrison-Low, Sara J. Schechner & Paolo Brenni (2016, 240 pages, ISBN 9789004324923), discusses the marketing of scientific and medical instruments from the eighteenth century to the First World War. The evidence presented here is derived from sources as diverse as contemporary trade literature, through newspaper advertisements, to rarely-surviving inventories, and from the instruments themselves. For an overview of this series, please visit the Brill web site. Proceedings of the XXV Scientific Instrument Symposium held in Krakow in September 2006. Title: "Proceedings of the XXV Scientific Instrument Symposium "East and West The Common European Heritage," Jagiellonian University Museum, Kracow, 2006, 335 pages, (ISBN 978-83-88659-51-5). Proceedings of the "Scientific Instruments and Museums" section of the XXth International Congress of History of Science in Liège, 20-26 July 1997. Title: "Scientific Instruments and Museums," ed. Maurice Dorikens (Turnhout: Brepols Publishers, Belgium, 2002). ISBN 2-503-51369-7. An Apparatus of Instruments: the Role of the Scientific Instrument Commission, ed. R.G.W. Anderson and G.L'E Turner (London, 1993) is a booklet containing articles based on a few of the papers presented to the XIIth Scientific Instrument Symposium held in Edinburgh in 1992. Proceedings of the 11th International Scientific Instrument Symposium: Bologna University, Italy, 9-14 September 1991, ed. Giorgio Dragoni, Anita McConnell and Gerard L'E Turner (Bologna: Grafis, 1994). Studies in the History of Scientific Instruments: Papers Presented at the 7th Symposium of the Scientific Instruments Commission of the Union Internationale d'Histoire et de Philosophie des Sciences. Paris 15-19 September 1987, ed. Christine Blondel, Françoise Parot, Anthony Turner and Mari Williams (London: Rogers Turner Books Ltd, 1989). Nineteenth-century scientific instruments and their makers: Papers Presented at the Fourth Scientific Instrument Symposium, Amsterdam 23-26 October 1984, ed. P.R. de Clercq (Leiden: Museum Boerhaave; Amsterdam: Rodopi, 1985). The Restoration of Scientific Instruments. Proceedings of the Workshop held in Florence, December 14-15, 1998 (Le Lettere, Florence: 2000). 113 pages. ISBN 88 7166 501 5. Price 18,08 Euro. This publication may be ordered from www.licosa.com.